Bombardier Recreational Products (BRP) is a Canadian company making various vehicles. Once part of Bombardier Inc., it was founded in 1942 as L'Auto-Neige Bombardier Limitée (Bombardier Snow Car Limited) by Joseph-Armand Bombardier at Valcourt in the Eastern Townships, Quebec. In 2003, Bombardier Inc. sold its Recreational Products Division to a group of investors: Bain Capital (50%), the Bombardier family (35%) and the Caisse de dépôt et placement du Québec (15%). The newly formed company was named Bombardier Recreational Products and included all the activities started 60 years earlier by its founder. As of October 6, 2009 it had about 5,500 employees working; its revenues in 2007 are above US$2.5 billion. BRP has manufacturing facilities in five countries: Canada, the United States (Wisconsin, Illinois, North Carolina), Mexico, Finland and Austria. The company’s products are sold in more than 80 countries, 18 of which have their own direct sales network. BRP has a long legacy of innovation and has multiple brands: Ski-Doo (snowmobiles), Can-Am motorcycles (ATVs & Spyder Roadsters), Sea-Doo (PWC and SportBoats), Lynx (snowmobile), Evinrude Outboard Motors, Johnson Outboards and Rotax. The Ski-Doo personal snowmobile brand is so iconic, especially in Canada, that it was listed in 17th place on the CBC's The Greatest Canadian Invention list in 2007. Before the start of the company's development of track vehicles, Joseph-Armand Bombardier experimented with propeller driven snow vehicles (similar to Russian aerosanis). His work with snowplane designs can be traced to before 1920. He quickly abandoned his efforts to develop a snowplane and turned his inventive skills to tracked vehicles. The company created the snowmobile market, and held its own after international competitors entered the market in the late 1960s. 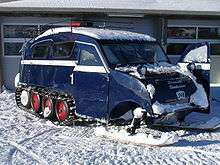 From the 1940s through the early 1970s Bombardier built the most successful snowcat models ever produced by any snowcat manufacturer. The B12 seated 12 people, and the C18 seated 18. Both were similar in design with long tracks in the rear and skis used to steer the vehicle. The B12 and C18 were very fast for their day, with speeds over the snow exceeding 30 miles per hour. Most historic and most modern snowcats have a top speed of barely 20 mph. The Bombardier B12 and C18 were probably the precursors to the more modern snow coach currently used by resorts for transporting tourists. In their day, the B12 and C18 vehicles were used as school buses, for mail delivery and as emergency vehicles in northern United States and Canada and were best suited to flat land conditions, frozen roadways or frozen lakes. While more than 3,000 of the Bombardier B12/C18 variants were produced, there was plenty of competition for Bombardier to contend with in both the North American and world markets. Most of the Bombardier production stayed in North American and it was the most popular series of snowcats ever produced, but it was clearly a niche product. 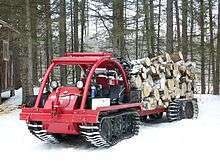 The front ski design was incapable of being used in deep snow and rough ground conditions and this opened the door for the development of dual track and quad track snowcats. Unfortunately the front ski design was not easily adapted to change for other ground conditions, so while it was successful on flat lands, frozen lakes and snow-covered roads, it could not compete on rough off road conditions. The combination of the lack of design flexibility, incompatibility with off road conditions, and the advent of modern snowplowing practices of public roadways beginning in the 1950s, and becoming common in remote areas by the 1960s probably led to the demise of the B12/C18 design. Today B12's are still in used in large scale ice fishing in northern Canada. Exterior of a steel bodied R64 operated by JVB between Tyin and Eidsbugarden. The Ski-Doo was originally intended to be named the "Ski-Dog" because Bombardier meant it to be a practical vehicle to replace the dogsled for hunters and trappers. By accident, a printer misinterpreted the name and printed "Ski-Doo" in the first sales brochure. Public interest in the small snowmobiles grew quickly. Suddenly a new winter sport was born, centred in Quebec. In the first year, Bombardier sold 225 Ski-Doos; four years later, 8,210 were sold. But Armand was reluctant to focus too much on the Ski-Doo and move resources away from his all-terrain vehicles. He vividly remembered his earlier business setbacks that forced him to diversify. Armand slowed down promotion of the Ski-Doo line to prevent it from dominating the other company products but still dominate the entire snowmobile industry. The snowmobiles produced were of exceptional quality and performance, earning a better reputation than the rival Polaris and Arctic Cat brands of motosleds. In 1971, Bombardier completed the purchase of the Moto-Ski company to expand the Ski-Doo line and eliminate a competitor from the marketplace. Some of the sleds made by Ski-Doo are the Formula III, Mach 1, and Mach Z with Rotax engines. While it is a commonly held misconception that all Ski-Doo snowmobiles were powered by rotary valved engines, this is not true. Only two cylinder Rotax engines were equipped with rotary valves. As a rule, the later rotary valved sleds were liquid cooled as well. Fan cooled sleds were usually piston port (2-stroke) induction. Sleds such as the formula III, later model mach-1's and the mach Z were powered by three cylinder, 2-stroke, Rotax engines. 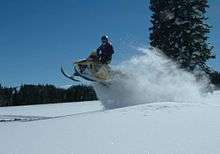 In 1994 the company produced the first snowmobile equipped specifically for mountain riding, the Ski-Doo Summit. Ski-Doo snowmobiles have consistently been extremely competitive for performance and in the marketplace up to the current day, taking a number of national titles in racing events from Sno-X to hill-climbing. In 1999 Ski-Doo introduced the ZX aluminum chassis which was lighter weight with better suspension and thus very successful in sno-cross competition. In 2003 Ski-Doo introduced rider-forward REV chassis, which changed the sport and was followed by other manufacturers. In 2008 Ski-Doo introduced the XP chassis, which moved the rider further forward with major weight reduction. The XP was the lightest machine available, with power-to-weight ratios in the Summit models for the first time under 3 lb per HP. During the 1970s, Bombardier built the Can-Am brand of off-road competition motorcycles designed for motocross and enduro with Rotax engines displacing 125, 175, 248 and 366 500 and 800 cc. The bikes competed successfully in professional racing with Gary Jones winning the 1974 US 250cc AMA motocross national championship. In 1983, Bombardier licensed the brand and outsourced development and production of the Can-Am motorcycles to Armstrong-CCM Motorcycles of Lancashire, England. 1987 was the last model year for Can-Am. In 2007 Bombardier renamed their all-terrain vehicle line of products Can-Am. Can-am Off-Road has seven models of ATVs, the Outlander, the Renegade, the Commander, The Maverick, the DS, the Traxter, the Quest, and the Rally. The Traxter and Quest (no longer in production) had two engine sizes 500cc and 650cc. The Rally (also no longer in production) was available with a 200cc engine. The Outlander is a utility style ATV available in multiple engine sizes, including 400cc and 450cc single cylinder and 500cc, 570cc, 650cc, 800cc, 850cc and 1000cc V-Twin engines. The Outlander MAX is available for 2-up riding and the Outlander X-MR is built specifically for mud riding. The Renegade is also available with multiple engine choices, a 500cc, 570cc, 800cc, 850cc or 1000cc V-Twin engine. The Renegade X-XC is a separate trim level built specifically for cross country racing. The Outlander 800R X-XC is a version of the Renegade with the same trim level for cross country racing and non-racing trail riding. The XT-P is the modern outlander XXC and features the XT package with front sway bar and beadlock wheels. The 1000cc engine was introduced into the quad classification in the 2012 model year for both the Outlander and the Renegade series. The DS has four engine choices, a 450cc, 250cc, 90cc and 70cc. A 650cc engine was once available but has since been discontinued. An "X" trim level is available for the DS-450 and the DS-90. The Commander is a SSV or Side by side introduced for 2010 with either 800cc or 1000cc engines. Commander has several trim levels, including XT, X and LTD (Limited) at the time the only engine option for the extra packages was the 1000. The XT had upgraded wheels, winch, front bumper and upgraded gauge and steering wheel. The X package had Bumpers, rock sliders, XT gauge and steering wheel, X package seats, and beadlock wheels. Commander Limited includes air ride suspension, an am/fm radio with four speakers, an iPod adapter,XT package and built-in touch screen GPS. All Can Am ATVs except the DS-70 and the DS-90 feature four-stroke Rotax engines. The maverick side by side was introduced to stand up to the commander's rival the Polaris RZR XP 900. The Maverick has an updated version of the commander's 1000cc V-Twin Rotax engine (1000R) this engine had a massive 101 horsepower. This was achieved by using high flow dynamics to increase exhaust and air flow. The maverick was a revolution into the horsepower triple digits. The maverick comes in 6 packages today (February 2014) Base, XRS, XRS DPS, XMR, X ds, and X ds Turbo. In the X ds lineup Can Am brought the first factory installed turbocharged engine to the industry. The turbo boosts the horsepower of the maverick from 101 horsepower to 121 horsepower. They now make Ski-Doo and Lynx brand snowmobiles, all-terrain vehicles, Sea-Doo personal water craft, jet boats, and Evinrude outboard motors (through the purchase of Outboard Marine Corporation). Bombardier Recreational Products no longer sells outboards under the Johnson brand since 2007, as they have moved all sales entirely to Evinrude Outboard Motors. They support existing Johnson outboard motors through servicing and parts. They also produce motorcycle motors, kart motors, and small airplane motors, through their Rotax division. In October 2007, Bombardier Recreational Products Inc. ordered at least some U.S. ATV dealerships to stop selling vehicles to Canadian customers, as the sales were a violation of dealer agreements to respect assigned geographic boundaries. Bombardier also announced that the warranty on any craft purchased by a Canadian in the United States – even if the purchase was initially made by an American - would be void. Newspaper articles revealed that some models were being sold in Canada for as much as 40% above prices in the U.S. In September 2012, the company announced that it would exit the sport boat business citing a decline in global sales in the marine industry. This meant the loss of 350 jobs, including most of those at a plant in Benton, Illinois. On May 29, 2013 the company announced the closing of an initial public offering of 12,200,000 subordinate voting shares of the company at a price of $21.50 per share resulting in gross proceeds to the company of approximately $262,300,000. The net proceeds from the offering were used to repay outstanding loans. The company's shares now trade on the Toronto Stock Exchange. ↑ "profile". Bombardier Recreational Products. 6 October 2009. ↑ "Worldwide Presence". Bombardier Recreational Products. 6 October 2009. ↑ "Rants and Raves: Ten Sleds that Shaped the Sport". Retrieved December 17, 2008. ↑ "Gary Jones at the AMA Motorcycle Hall of Fame". motorcyclemuseum.org. Retrieved 2 April 2012. ↑ Mike Spinelli. "So That's What That Was: The Can-Am Spyder". jalopnik.com. Retrieved 2009-07-31.